原文：Negri, Antonio. “Crisis of the Planner-State: Communism and Revolutionary Organization (1971).” In: Revolution Retrieved. 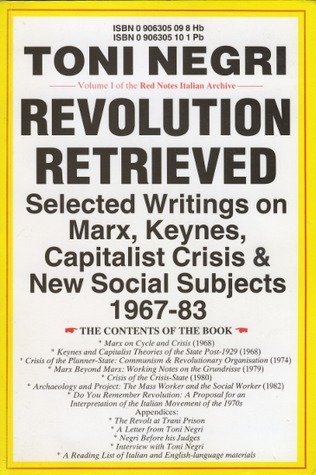 Writings on Marx, Keynes, Capitalist Crisis and New Social Subjects. 1988. Excerpt: Part 4 (Labor as Revolutionary Subject: The Basis of the Communist Program and Proletarian Appropriation), part 7 (Against Enterprise-Command: The Organization of Insurrection Within the New Composition of the Working Class), and part 9 (Our Immediate Task). This entry was posted in 中文, 全球视野, 文本 and tagged Antonio Negri, operaismo, 工人主义. Bookmark the permalink.